During and after the realization of the project I understood that I forgot a lot of details and rules for example the behaviour of the participants releated with my work, the main thing for a perfect result. Working with a group of twenty people at the same time and all together is very hard because if just a little thing wasn't expected all the process goes wrong. In my case, in special, the dynamic and the approach were basic aspects. The work need more attention during the preparation of the rules and the direction of these during the realization of the response/relations gestures, (coordinated by me). After suggestions, I understood that the main and basically element (maybe for every project) is the seriousness in the approach and in the attitude, that doesn't mean not enjoy yourself or don't be spontaneous but simply have fun in a way that is not childish but in a way useful for the aim (with dedication). In relation with my project, I want to develop a dynamics made by a connection and a linking of a consecutive series of short and slow motions inside the stage. Create a domino effect (chain) to narrate ours relations through the body. Working on the portrait technique to spot out different aspects of the personality of a group of individuals requires first of all to find out a mechanism to put them in relationship. In addition to all the classical problems involved into a photographic portrait session, the particular focus on connections and spontaneity presented the challenging goal to allow people who came in different moments to interact indirectly one with each other in the most natural possible way keeping alive the exquisite corpse connection. As in other projects of the same kind was very interesting the discussion about the relationship between the real people involved and the photographic representations of them used to create the connections. While usually there’s no doubt that a photographic representation is not something alive or interactive, when asked to interact with it, most of the people pretended to interact with the subject and not with the object (monitor or paper print). This happened (and usually happens) probably because, especially in portraits, the support identity is much weaker than the subject one in terms of empathy, so connection between subject and user becomes much more natural and strong than the relationship between the user and the physical substrate of the representation, which is neutral and unattractive in that particular contest even if it would be the only one truly “physical”. I generally find quite hard to make the subjects to act avoiding any stereotype coming from the contemporary imaging examples. It’s interesting that when I don’t give them enough time to think about a reaction they tend to assume very similar positions, in a way that tend to prove the fact that spontaneity is conventional and repetitive (in this culture) and un-spontaneous is generally more original and interesting which is the opposite of what happens when doing simple portraits (or maybe not). I also usually find quite sad that the “creative behavior” has become a stereotype itself which is often imposed as a standard method of work, in a field in which usually the efficiency overwhelms originality. My Exquisite Corpse is made of sound, fun and experiments by everyone in the workshop. The best thing is that it's almost impossible to recognize every single part in whole song; and it give surprising result in everyone in the double role of listeners and author. Everyone became a musician, leading to the process of creating a song, not in the final resutl of having a good song, or a nice melody. Real music (noise and every sounds) fits with mind and emotion as harcore and punk are not about rockstarism. Thinking about the exquisite corpse principle, the most I have found interesting were the surprise which stands in the end and the idea of "the one made by a moltitude" without a total consciousness. The unconsciousness have fascinated me, and so I started thinking about how places connect us unconsciously through our presence, but above all how we choose our place standing inside a space. I often wonder myself who were here before me? I can't know that. It's an obvious topic linked to time and its past, but how should I rappresent the people's presence inside a place, happened in different moments? I thought with photographic's multiple exposures. Maybe through this way we're going to know hidden connections between persons. By making this project a lot of topicts came to the surfac and I thin I could develop these in the future: - unwarely composition; - moments robbed to time - hidden spacial connections between persons and their own space; (About "our own space" I have developed later that maybe this is connected to my presentation's happening, where I asked to you to choose a place inside the studio as you felt yourself, at the beginning); - how a photographic set prevents person's spontaneity. Personally, i find really interesting the discussion about our works for some reasons. At first, we saw all the finished works of our mates: the exercise was an exquisite corpse so we know our own contribution, the project but not the final result. Then we could compare all the works: some of them were very spontaneous and funny but with strong ideas at the base, other ones were a surprise (as Jessica's). Also when, in some cases, the idea was non so original, i found very good results. Every work can be potentially develop in the future and in some cases, i think, some more time will be very positive for the final result because people can think more carefully to their contribution. I see this revision as a "stage" (tappa) and i would like to continue to work on my project, to show all its potential also if it would be realized with other materials or with other sizes. Now that a collective discussion is done, now that we have a lot of comments and opinion it's maybe more easy and stimulant to continue the project and perhaps, do it again. I find the idea of making this video thinking about "personal's contribution" that's the principle of Exquisite corpse's game. Since the beginning of this workshop we have talk about our self-presentation to know each other better: we are a group of people with different thoughts, ideas, feelings, characters, behaviors et cetera and I think that this heterogeneousness might be interesting. I've referred to the concept of collage that interests me particularly: starting from a photograph of my face, each person has to add a particolar of her face to tranform it in something new and unexpected. After an experiment I decided to extend the project to the whole body: after have taken a photograph to to every classmate I've asked "what do you want to offer?" . The first person refers to my picture and add something of her body, the second add something referring to the collage of the previous two and so on... I was interested in causing reaction in people and finding connection between previous picture and next one, in seeing how my body changes interacting with other people. On Thursday, from the crit of my “Exquisite Corps”, based on a inique chain reaction between a person and a picture of another previous person, we discussed about some interesting aspects, especially about the different kind of reaction made by each of us. In fact, someone reacted with a strange position according to the position of the previous person, instead other people responded to the picture, and not to the subject in the picture, in relation with the size or the place of the poster on the wall. This is a strange thing because I didn’t give any instruction in this way and it’s amazing to analize this element beacause it’s possibile to understand why these reactions are completely different. Another interesting point discussed during the crit is the ambiguity of the final result because we were not able to understand what was real, physical and what was picture. In particolar, this discussion reminded me the work of the famous artist Renè Magritte with his pipe (“Ceci ne pas une pipe”) where the aim of the painting is to explore the differences between the real world and its representation. I’m satisfied of the final result but it’s a pity for the bad quality of the prints because with better pictures could be possibile to distinguish each person…or photo?? From this work I learnt to pay my attention to the process of the idea and not just to the final product but, maybe, this reasoning is more suitable for other projects that I saw on Thursday, because in my case I think that the set of pictures is funny and necessary to understand in the best way all my project. My exquisite corpse is based on adding and splitting materials. I decided to use "pongo" , a play for children, which is used to modelling and mixed materials to create new colors. I asked to the members of our studio to choose one color and mixed it with the "pongo" of the person before. Mixed it as she/he wants and create a sfere, then split it in two piece and use a half to create a new sfere and the other half pass to another person. In this way we formed a lot of different colors and size sfere from the first, the smaller to the last, the bigger. Each sfere had inside all the previous colors choosen. It's interesting to see how the balls was formed by colours not completed mixed and we could follow the creation order. Cause to the deteriorate of pongo which now is dry and some cracks appears on the surface, I decided to do another time the processing but now using a different material, the cernit which once I've put it in the oven, it became rigid and don't change its color. I hope, in that way, the final project will bacame more beautiful to see. After the presentation and a littel free time i decide to make a sculpture with the colours in form of the stick... (a "colourstick" using just colours- from each person,in two versions: one fast the other in 16 days) (maybe my "flying colours" find a form) I think i need to concretise my idea to find a solution for the possible varians...Even if "exquisite corpse" could seem at the beginning a simple and maybe funny brief, we saw that it wasn't so easy to develop and it requested attention and some work from every person in the class. I think that some projects could have been better developed if everybody paid the right attention to everybody's work. As someone said during the last crits, we should feel responsible for all the results, also failures are in a way everybody's fault. This made me think about dynamics in groups: it's very difficult to work together but when everybody participate the result is great! I think that in certain cases, even if the starting idea could seem very simple, class contribution to the works made them very brilliant and maybe funny. However, it was very interesting to see how all the projects developed: some of them were a real surprise to me and I liked them a lot! I am very happy about my food project, even if Friday presentation was not good. I am happy because I think the process, the class involvement and the result during last Monday 'performance' were good, so I believe I could try to develop 'something' around it (documentation/presentation...), starting from an existing basis. My main problem is that I am used to think about visual communication, so it's a bit difficult to find alternative ways of presenting a work. On the other side, doing nothing and letting that only the experience itself remains 'into' the people that lived it, seems not enough to me. Starting from Flavia suggestions to take other people 'reactions', thoughts and feelings about my project, I'm thinking about asking to several people to tell me or to write what they think about my project: not only to the class and to Daniel and Flavia, but also to friends I talked about it, to students from other classes that passed while we were working, to my mum (that helped me at home to prepare everything) and so on...starting from the more involved person to people that were not interested at all but in some way participated to the project (for example making comments). Then all these 'testimonies' could find a graphic layout/presentation (I don't like the idea of having a written text and stop), but it really depends on what people will tell me.After my presentation during the crit i was a bit confused, i was trying to think abuot what goes wrong in the process of my projects and also to some of the other project presented by my class mates. My main doubt is that i asked too much to do in such a short time, so i recived a fast and not so careful feedback. But i like my color corpse, i think that as a complete contribution it look quite homogeneous, even if some photos are no at the top of my calss mates potential. About the project of the picture chain, i think that maybe the picture maybe were not the best ever, but them just shows an emotional reaction to the previous one, in order to the exquisite corpse tecnique. For the futre of my projects i think that i will keep on working on the colour corpse by myself.. If i'll be able to handle the whole project with my hand maybe the result will be different. 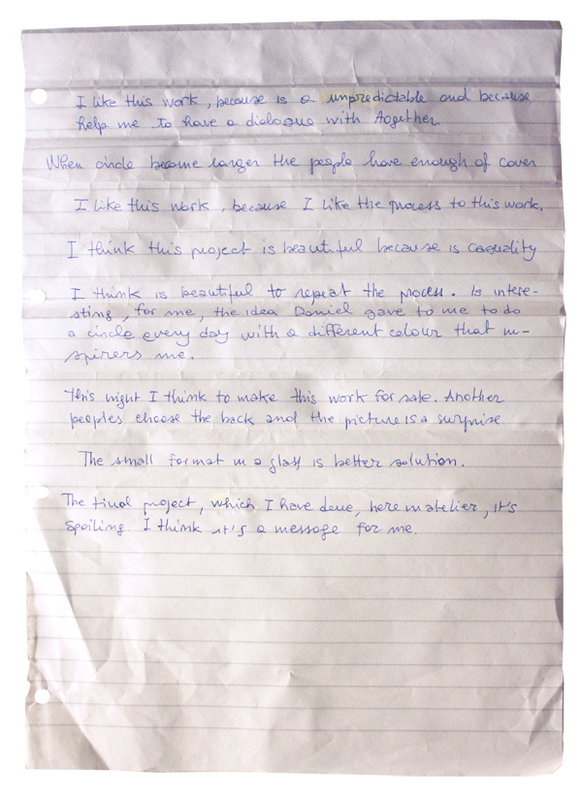 The project of exquisite corpse is fantastic! I like to cooperate with my colleagues, in a two days of presentation I understand that is so much important how you present your project to persons who don’t know what I’ve done. For me is so much important to confront with a different people, for understand what I have wrong. I have receive a good advice and crits for my work! I think that my project is not immediate as much as other works in our group, also because of the complexity present in it, that is a constant of my method of work, even if in the end everything seems very immediate and maybe more obvious than what I expected. But I'm sure that altogether the exquisite concept is present in this project in different ways, and that's what I tried to do thinking about an 'exquisite corps' project: the most important concept for me was to transmit the idea of movement that is contained inside the principle of exquisite corps and the tecnique of passing the project from one to another, like a never-finished-opera; the name 'exquisite ghosts' in fact is referred to the fact that you cannot see this entire little changings with passages from a person to another, but you perceive that there has been an enhance, of course that something more has been added. The absolutely interesting fact of this technique is its potential, that you cannot imagine before starting to work with people at your exquisite corps, because just the decision of one person could influence all the other. In this particular case I've expecially notice that all the people were influenced by the others, expecially physically, but without knowing it, and most of all that even if there wasn't a whole collaboration between two of them to make the moving shots, the result has been beautiful and consistent anyway. In general, for most of the 'exquisite corps', I've hunderstood that it's also important that people feel well doing it and that you ask them simple and short requests, in the way to obtain the most natural and spontaneous reaction to the previous work. I would like to make also other projects similar to this one, just the natural colorful development of this, even if they are more complex than those with the 'exquisite' method. So I would like to repeat the double moved shoots with people that wear colored stuff; one time just wearing t-shirts in a chromatic scale, and another time with people that move a colored-favourite object (dress, hat, book, makeup on the face, light bulb, flowers, etc); I will need also to document all by video to show in a more clear way the dynamics of the movements and the degree of interaction between people. I have thought a lot about crits on my work, or maybe on my way to work…about the fact that every person have worked for me, but it’s all for my mistake that my exquisite corpse didn’t work. I guess, even if I were in terrible late, I should have shared my work with the class, more than I did… Talking about the procedure of the project and if it would have worked, rather than trying to oblige the others to do it. But at the end of the Fridays discussion I’m not agree with making again the work itself by their own, without the collaboration of everyone in the class (I think necessary in a exquisite corpse) I think it’s sure that if someone likes drawing and then he draw all his project, he would have a better result…but only in the form, not about the contents. I think everyone should have control of their project even if the project itself is a contribution of 20 different people …or maybe trying to do it and fail…like me! !